The put the little window on there like, “Check out the crazy colored rice!” But there is no crazy colored rice. What is your end game here TJ’s? 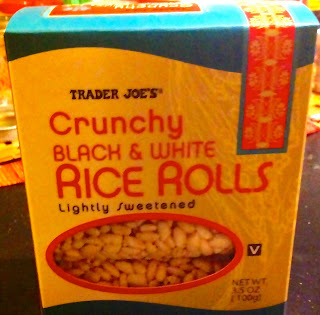 Trader Joe’s Crunchy Black and White Rice Rolls are just rice folks, slightly sweetened, crunchy rice in a little roll. 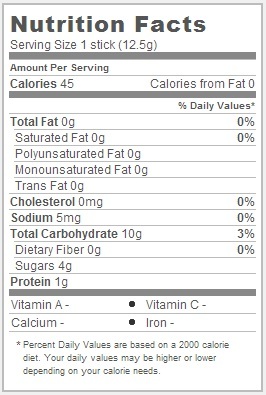 They’re good tasting, pretty healthy and convenient. That’s about all there is to say on these, folks. I mean, c’mon, really – it’s just rice. I suppose I should be thrilled by coming across such a cheap, tasty, and healthy snack, but I’m not a mom. I’m a guy with a slightly faulty “Act Like A Normal Person” switch in his head. The light is steady from time to time, but mostly it sort of blinks on and off. I suppose I’m just a little disappointed by such a utilitarian, ordinary snack after the aggressively weird brown butter, lemon and parsley popcorn the other day. We must wonder, however, what is black rice, and why cylinders instead of disks? The main reason I picked these rolls up was because of the intriguing mention of “black rice” in the title. Now, there are several kinds of black rice cultivated around the world, form the “forbidden rice” once reserved only for the Chinese Emperor’s table to Thai black jasmine rice. The exotic lure of the promise of such a deviation in color pulled me in, much as the promise of black eggs, or black milk would have done. Unfortunately, I found myself left to disappointment. Not only is it impossible to taste any difference between the “Black Pearl Rice” and “Sushi Rice” used, but impossible to even see any difference. Black rice usually cooks up to a deep purple color, but whatever cooing method Trader Joe’s employed has denatured any chromatic differences between the two. Perhaps I should champion these black and white rice rolls as a paragon of color-blind, racial harmony, but instead it feels bland and sterile. Even TJ’s, usually so florid with their food descriptions, can’t seem to muster much enthusiasm for their generic rices in the product copy. Humph. This, I sense, may be my own idiosyncratic quibble. As I already said, these really taste quite good – rice cake or not. Even better, they appear to be air puffed, like a bunch of lightly sweetened corn pops smushed lightly together, giving the whole roll a light and airy feeling. This certainly an advancement over ordinary rice cakes whose density can sometimes make a snacking session feel like an arduous slog. So, sweet, light and crunchy – what’s not to like, really? It may, of course, be possible to take issue with the shape. Why cylinders, TJ? Is the traditional disk shape too square for you? Not hip enough for the educated, middle-income crowd? Functionally, this is not actually much of an issue, except in one important way – it’s difficult to layer or spread any condiments on the rice rolls. As a man who always has some room for a nice puffed rice cake smeared with a thickness of peanut butter, this qualifies as a design flaw. A final word, unlike some other items I’ve reviewed, the rice rolls compare very well to their mainstream alternatives. Despite the differences in shape and texture, Trader Joe’s Black and White Rice Rolls are nearly identical in sugar, carbs and calories to Quaker’s ubiquitous sweetened rice cakes. Would I Recommend These: Yes, especially to moms. Would I Buy Them Again: As I have no kids and enjoy spreading peanut butter, probably not. Final Synopsis: A good, but chromatically perplexing, rice snack.